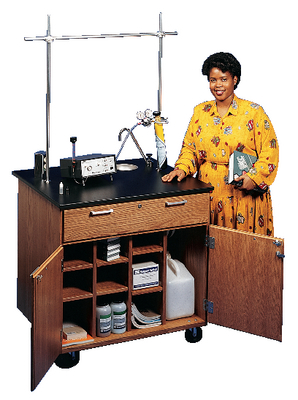 This mobile lab provides all the features of the standard laboratory bench — a large 36? high laminate worksurface, running water, benchtop electricity, support rod sockets, and lots of below-counter storage. On its four casters, you can wheel the mobile lab anywhere and then lock the casters to hold the unit in place. Includes a retractable power cord, support rods and a water pump with two 2 1/2 gallon jugs, one for water supply and one for waste. Also included are six adjustable shelves (24? L x 7 3/8?D) and a table-wide drawer (32 1/2? x 12? x 5 1/2?). Both the doors and drawer can be locked. Standard finish is Northwoods Oak. The optional Overhead Mirror can be added for better viewing of experiments or demonstrations. Overall Dimensions: 36?L x 30?D x 36?H.